The cutaneous proopiomelanocortin (POMC) system is an important regulatory system, which controls pigmentation, inflammation, and the stress response of the skin. 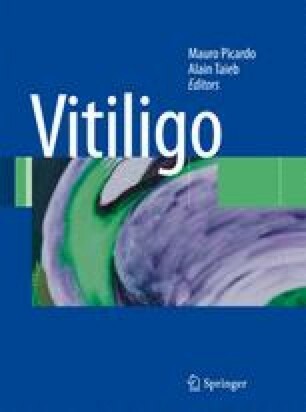 Based on their potent melanotropic effects, selected melanocortin peptides derived from POMC have been tested in the past for their efficacy in vitiligo. To investigate the potential role of the POMC system in the pathogenesis of vitiligo, a limited number of experimental studies have been performed until now. These studies aimed at (a) determining the peripheral blood levels of circulating POMC peptides, (b) examining possible genetic defects of distinct POMC components, and (c) investigating the in situ expression of various components of the POMC system.